Secretary of State John Kerry misled the American people last summer when he assured them that the U.S. government knew for a fact that the Syrian government was responsible for the Aug. 21 Sarin gas attack outside Damascus, an incident that killed several hundred people and nearly prompted a U.S. military assault. A new report by two American weapons specialists, entitled "Possible Implications of Faulty US Technical Intelligence in the Damascus Nerve Agent Attack," makes clear that the case presented by Kerry and the Obama administration was scientifically impossible because the range of the key rocket carrying Sarin was less than a third of what the U.S. government was claiming. The two rocket specialists -- Richard Lloyd, a former United Nations weapons inspector who is now associated with Tesla Laboratories, and Theodore A. Postol, professor of science, technology and national security policy at the Massachusetts Institute of Technology -- concluded that the rocket's limited range meant that it couldn't have come from Syrian government-controlled areas as delineated by a map released by the Obama administration last August. Yet, in a State Department speech on Aug. 30, Kerry declared -- with what can now be called false confidence -- that the U.S. government knew that the attack was launched by the Syrian government from its territory. He also implied inaccurately that the U.S. intelligence community was in accord with these claims, and he dissembled when he asserted that the Obama administration had declassified evidence to let the public make up its own mind. No such evidence was ever released. With the U.S. military poised to bombard Syrian government targets, Kerry declared, "Our intelligence community has carefully reviewed and re-reviewed information regarding this attack and I will tell you it has done so more than mindful of the Iraq experience. We will not repeat that moment. Accordingly, we have taken unprecedented steps to declassify and make facts available to people who can judge for themselves." However, while Kerry made reference to alleged phone intercepts and other alleged evidence of Syrian government guilt, none of it was ever released for independent analysis. Instead, the U.S. government put out a map showing where rockets carrying nerve gas supposedly had landed -- in parts of Damascus controlled by the rebels -- and contending that the launch sites had been in government-controlled areas. "We know where the rockets were launched from and at what time," Kerry said. "We know where they landed and when. We know rockets came only from regime-controlled areas and went only to opposition-controlled or contested neighborhoods." Kerry also hyped the emotional case for war by presenting claims about casualty totals that now appear to have been wildly exaggerated and based on more dubious intelligence. "The United States government now knows that at least 1,429 Syrians were killed in this attack, including at least 426 children," Kerry said, citing a number that the Wall Street Journal later reported was derived from applying facial recognition software to videos of bodies posted on YouTube by the Syrian opposition and then subtracting bodies in bloody shrouds. This bizarre methodology produced the number 1,429, which was about four times higher than numbers provided by doctors on the scene. But Kerry pitched the story to the American people as lacking any doubt regarding the guilt of Syrian President Bashar al-Assad. "This is what Assad did to his own people," Kerry declared. Then, in what was clearly a call to war, Kerry added, "So now that we know what we know, the question we must all be asking is: What will we do?" Though President Barack Obama avoided some of the specific falsehoods contained in Kerry's Aug. 30 speech, he pronounced the same conclusion about the attack coming from a government-controlled area and mocked skeptics of his administration's case as essentially irrational. "The evidence is overwhelming that the Assad regime used such weapons on August 21st," Obama said during his Sept. 24, 2013 speech to the UN General Assembly. "These rockets were fired from a regime-controlled neighborhood, and landed in opposition neighborhoods. It's an insult to human reason -- and to the legitimacy of this institution -- to suggest that anyone other than the regime carried out this attack." It was this proclaimed certainty from Kerry and the White House that persuaded some Americans, especially those in Official Washington, that the Assad regime was responsible for the Sarin gas attack. Other possibilities, such as an intentional provocation by radical Islamist rebels or a tragic accident, were shunted outside the borders of respectable debate. 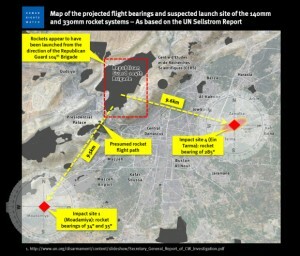 The conventional wisdom was solidified in September when Human Rights Watch, which had been advocating for U.S. military intervention in Syria, and the New York Times produced another map supposedly tracing the flight paths of two rockets recovered by UN inspectors back to alleged launch sites, 9.5 kilometers away at a Syrian military base. But holes in that analysis quickly appeared -- at least at a few Internet sites -- since only one of the rockets was found to contain Sarin and the other rocket not only was clean of chemical weapons but also clipped a building in its descent making any precise calculation of its point of origin impossible. The HRW/NYT "vector analysis" ultimately collapsed when independent analyses were performed on the one recovered rocket that did carry Sarin and had landed east of Damascus in the Zamalka neighborhood. Munitions experts calculated that its range was probably about two kilometers, not even a third of the distance needed to have originated at the Syrian military base northwest of Damascus.